Participants in the first WIOMSA Ocean Acidification Workshop – 24-25 October 2017, Dar es Salaam, Tanzania. The ocean absorbs up to 30% of the annual emissions of anthropogenic CO2 to the atmosphere, helping to alleviate the impacts of climate change on our planet. However, this comes at a steep ecological cost, resulting in changing acidity levels in the ocean. On 24-25 October 2017, ocean acidification research and monitoring in the Western Indian Ocean region was promoted at a workshop in Dar Es Salaam, Tanzania. Little is actually known about ocean acidification in the Western Indian Ocean (WIO), as long-term observations and relevant experiments have not been carried out. This means that countries in the WIO region are not able to report towards target 14.3 of Sustainable Development 14, which asks to “minimize and address the impacts of ocean acidification”. The Western Indian Ocean Marine Science Association (WIOMSA) Ocean Acidification Workshop therefore provided the platform for a range of stakeholders, including scientists and policymakers, to discuss how to improve knowledge on the current and expected impacts of reduced pH on marine life in the region. Twenty-three international experts representing international organizations and six countries from the WIO (Kenya, Madagascar, Mauritius, Mozambique, South Africa and Tanzania) used this unique opportunity to develop strategies to improve their scientific capacity to detect and observe the effects of ocean acidification, based on their countries’ vulnerability to ocean change. “From local to global – this workshop is only the starting point. New projects and new capacities with respect to ocean acidification arising from our discussions here will create new knowledge. This understanding will enable the Western Indian Ocean communities to get prepared for the impacts of ocean acidification at the local and regional level, and it will improve global predictions needed for global actions,” said Kirsten Isensee, IOC Project Specialist, to the participants. “Local adaptation strategies are critical under ocean acidification and climate change, and it is very important to find common ground for research and policies. The Western Indian Ocean region can present a great example for scientific cooperation on ocean acidification by gathering missing knowledge and acting in the most appropriate manner to protect the critical ecosystems and the many benefits provided,” mentioned Patrizia Ziveri, ICREA research professor at ICTA-UAB, participating to this workshop. Acidification is the decrease in seawater pH and closely linked shifts in the carbonate chemistry of the waters, including the aragonite saturation state, which is the main form of calcium carbonate used by key species to form shells and skeletal material (e.g. reef building corals and shelled molluscs). 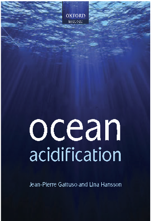 Concerns about ocean acidification, first expressed in the early 1980s, are now confirmed. Observations in the open ocean and coastal areas have revealed that marine acidity has increased on average by about 26% since the start of the Industrial Revolution. In some regions, the changes are further amplified by natural processes such as upwelling (often cold, CO2- and nutrient-rich water travelling from the deep sea toward the surface), resulting in conditions outside biologically-relevant thresholds. 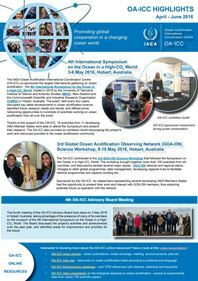 “Expanding understanding of ocean acidification status and effects on biology in local systems, like the Western Indian Ocean region, is a goal of the Global Ocean Acidification Observing Network. This workshop was essential to exchanging knowledge and building this capacity,” said Jan Newton, University of Washington faculty and GOA-ON representative who contributed to the workshop. As atmospheric CO2 levels increase, estimates indicate that the ocean could be nearly 150% more acidic by 2100. The two-day workshop was kindly hosted by WIOMSA and the Nairobi Convention Secretariat, supported by IOC-UNESCO, Future Earth Coasts, the Global Ocean Acidification Observing Network (GOA-ON), the Ocean Acidification International Coordination Centre (OA-ICC) of the IAEA, the University of Washington, and the Institut de Ciència i Tecnologia Ambientals of the Universitat Autònoma de Barcelona (ICTA-UAB). IOC-UNESCO, 3 November 2017. News release.